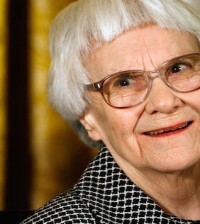 Harper Lee has finally agreed to let “To Kill a Mockingbird” become an e-book. As of July 8, HarperCollins Publishers announced that the novel will release on e-book and audiobook platforms. Lee, in a rare public statement, cited a “new generation” of fans in agreeing to the downloadable editions of her Pulitzer Prize-winning classic. There are still several authors who are holdouts in this day of digital entertainment. Lee and her novel sit alongside J.D. Salinger and his The Catcher In the Rye as a missing prize for e-book fans. “To Kill a Mockingbird” was first published in July 1960 and has since sold more than 30 million copies worldwide. It continues to sell more than 1 million copies a year. It was adapted into a 1962 movie of the same name that featured an Oscar-winning performance by Gregory Peck as Finch, the courageous Alabama attorney who defends a black man against charges that he raped a white woman. The new audiobook will be a downloadable edition of the existing CD narrated by Sissy Spacek. Harper also is releasing an “enhanced” e-book that will feature additional material. Spokeswoman Tina Andreadis said the extra features had not yet been determined.